My mother-in-law made these every year for Christmas. These little bites of heaven are a favorite sweet for Halloween, Thanksgiving and Christmas. 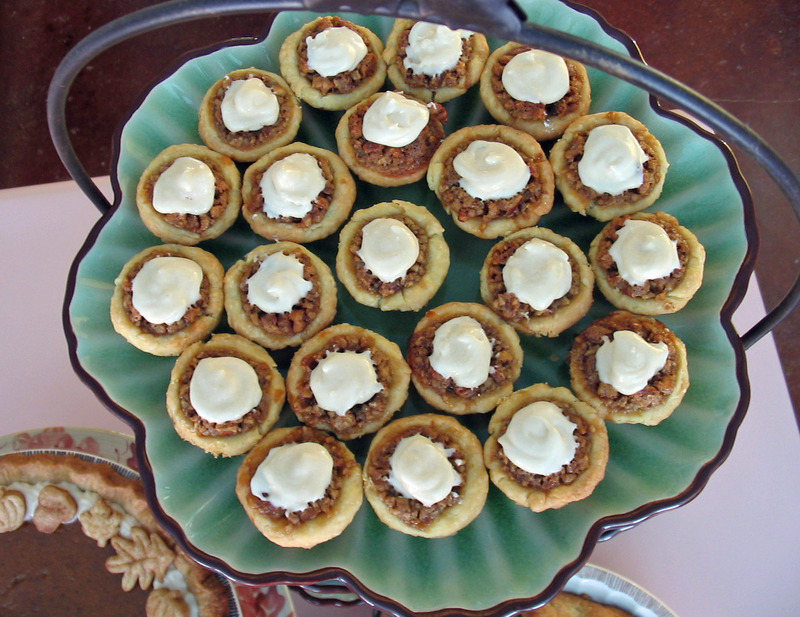 Tassies are content intermingling with Pumpkin Pie and Apple Crostata or All American Apple Pie on a dessert buffet. Whereas I can easily say no to a slice of pecan pie, I always say yes to a Tassie. It had me at hello. 1. For the dough: In a stand mixer or in a bowl with a hand blender, add softened butter and cream cheese, mix on low until well combined and then add-in flour. Divide into three equal logs, wrap in Saran wrap and refrigerate for at least an hour or overnight. 2. For the filling: Cream together butter, brown sugar and vanilla. Add eggs, dark corn syrup and pecans; mix thoroughly. 3. To make tassies: Preheat oven to 375°F. Press 1/2-ounce balls into miniature tart pans or mini muffin pans. Alternatively, you can roll-out dough and cut out 2-1/2 -inch rounds to fit into pans. Place pans on cookie sheets for easily placing in and removing from oven. Fill shells to top with filling. Bake 20 minutes. Cool in pans placed on cooling racks before removing Tassies to a serving plate. *If you dislike using corn syrup, try substituting an additional 1/3 cup brown sugar and 1/3 cup maple syrup.